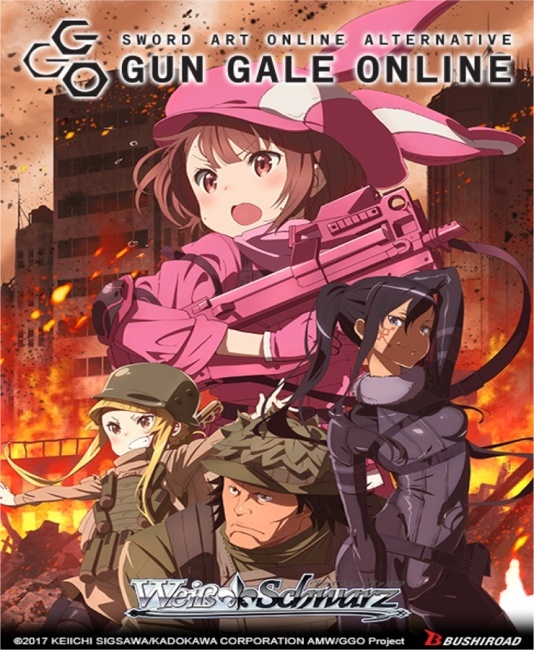 The anime Sword Art Online Alternative Gun Gale Online, a spinoff of the Sword Art Online series, will be featured in a new Trial Deck and Booster Packs for Bushiroad’s Weiss Schwarz Trading Card Game, both releasing on May 17. 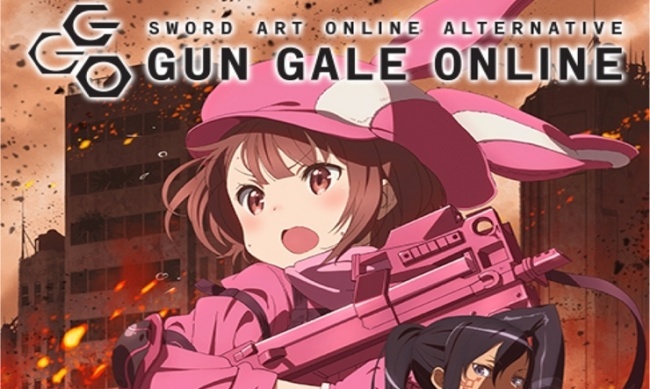 Sword Art Online Alternative Gun Gale Online picks up where Sword Art Online leaves off, telling the story of a young woman who enters a virtual reality gunfight survival game called Gun Gale Online under the alias LLENN. Wielding her pink submachine-gun “P-chan,” she is an able competitor who befriends the widely-hunted player called Pitohui, who proves to be a favorite singer of LLENN’s in the real world. 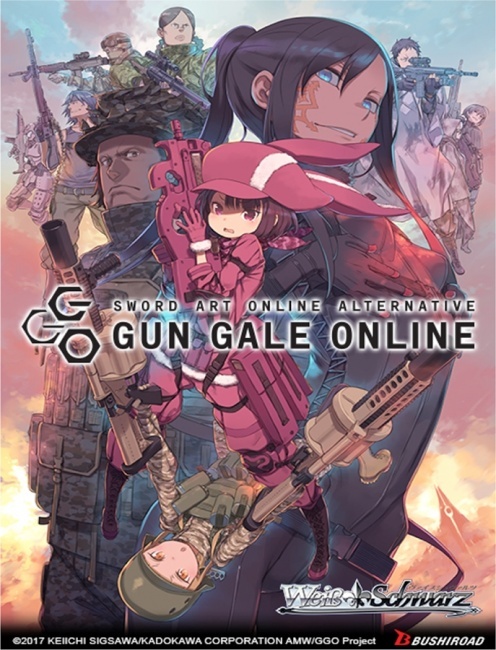 The main characters from the anime series, LLENN, Fukaziroh, Pitohui, and M are all featured in the SAO Alternative – Gun Gale Online Trial Deck. This fixed deck has 50 cards with 21 different types (including 6 parallels and 2 “shiny” cards). Some random decks will also include one of two rare cards with special embossing or one of two signature cards featuring signatures from voice talent that performed in the anime, either Tomori Kusunoki (LLENN) or Chinatsu Akasaki (Fukaziroh). 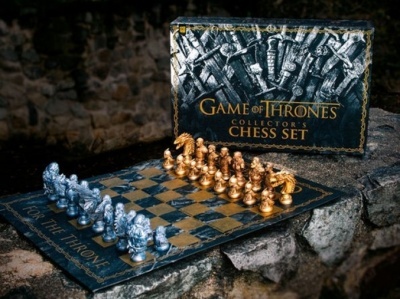 In addition, each deck comes with a rules sheet, playmat, and deck manual. 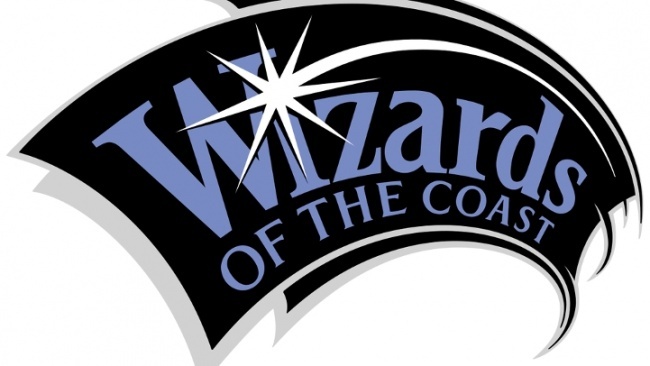 The remainder of the set will be sold in 8-card booster packs, and includes a total of 100 card types with 27 parallels. Signature cards for Tomori Kusunoki, Chinatsu Akasaki, and Yoko Hikasa (Pitohui) will be inserted in some random packs, and each 20-pack display box will have one of four possible PR cards as a box topper. 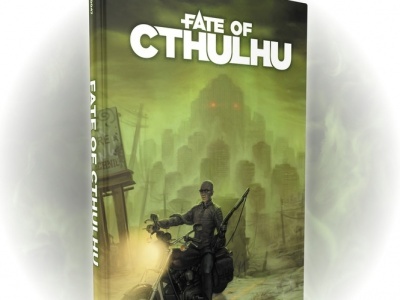 Four rubber playmats exclusive to the English language edition will be packed in each carton, which includes 16 displays. Sword Art Online has been featured in multiple Weiss Schwarz sets, most recently one based on Sword Art Online: The Movie (see “‘Sword Art Online’ Move inspires ‘Weiss Schwarz’ Expansion”). In April, Bushiroad will release the BanG Dream! Girls Band Party! MULTI LIVE booster expansion (see “Five Bands Take the Stage in ‘Weiss Schwarz Girls Band Party!’”).